OneCallAccess is a fully managed One Call Operation Management solution for e-Ticket and Call Center operations. Hosted by PelicanCorp in a high availability cloud environment, it manages all One Call tickets from any location and any time leveraging modern web and mobile based technologies. OneCallAccess is built using a unique mapping platform enabling the most accurate ticket capture on the market. 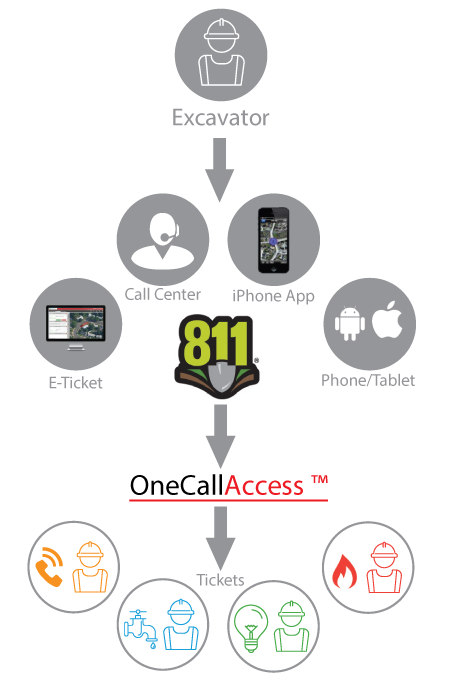 OneCallAccess provides a set of tools for any One Call operation to support its obligations to its members from GIS data updates, marketing/email campaigns, reporting and a range of notification and ticket format options. OneCallAccess offers a number of optional modules to support the specific requirements of the operation and the local processes. Currently available modules include excavation permits, plan collation and positive response. This same capability can be used to include additional modules to support local requirements. Users are guided through the process with simple messages and information boxes to assist. This includes all fields of data, mapping rules and even notification rules for Utilities. Regardless of the device being used, the OneCall ticket entry screens adapt and also provide location aware capabilities to allow tickets to be captured on site anytime of the day. The members portal allows One Call members to manage their own details, settings and the re-requesting of tickets when required. A full audit history is kept for all edits and approvals, ensuring the data integrity and ownership is maintained. ReportsAccess is a reporting portal which provides pre-saved reports, runtime filtering and export options which include the ability to set an automated schedule. OneCallAccess is hosted and managed in a cloud environment managed and controlled by PelicanCorp. Service Delivery and Operations teams support all our customers 24 hours a day 7 days a week. The systems are monitored using a range of industry best practice tools to ensure your service experience is excellent. Tightly integrated into the platform is a sophisticated mapping and GIS platform designed specifically for the needs of One Call operations. Supporting multiple providers such as Google, Bing or any preferred mapping service to suit local requirements, OneCallAccess allows contractors to navigate easily to a dig site and begin describing their locate ticket. Mapping information captured at this point can be transmitted to utilities and One Call members in their preferred formats. A unique feature of OneCallAccess is its communications to users and members. All users submitting a ticket to OneCallAccess will receive a confirmation summarizing the ticket, the location drawn on the map and the Utilities notified. The communications feature can also be used on an ad-hoc basis to help share any supporting information between contractors and Utilities as required. This helps in situations where Utilities need to communicate to contractors working in a specific location or to communicate a change of processes from a certain Utility. All user interfaces for OneCallAccess are web based and easy to use. The design and structure of the inquiry process allows any user with limited experience with web systems or forms can successfully submit and complete an accurate One Call ticket. One Call centers using OneCallAccess as their core platform are achieving web ticket volumes higher than 90%, making it arguably the most easy to use One Call system on the market. Maintaining a close grip on the day to day operations of any One Call system is critical. OneCallAccess supports this by providing a comprehensive set of tools for the Call Center to manage tickets, member configurations, special reporting requests from members and ticket dispatch. It also allows for real time analytics on system performance, ticket based statistics and contractor usage. A key point of difference for OneCallAccess is the ability to use mapping to describe a dig site and accurately depict a location requiring Utility mark out or plans. OneCallAccess provides users with simple, easy to use mapping tools to enable drawing directly onto any map provided by a One Call operation. The shape and ticket detail are transmitted as part of the utility notification and a confirmation summary supplied to the contractor.